Belgian Laekenois is one of, and probably the oldest of, four related varieties of Belgian Shepherd Dogs. The Laekenois originated in the mid- to late 1800s in Flandres, where the dogs herded sheep and guarded flax fields. In the early 1900s, the Brussels police force and Belgian army used these versatile dogs. The Belgian Laekenois stands 22 to 26 inches tall and weighs between 40 and 80 pounds, with females smaller than males. The head is strong, the eyes are almond-shaped and dark brown, and the ears are upright and large. The body is as long as it is tall at the shoulder. The tail is long. 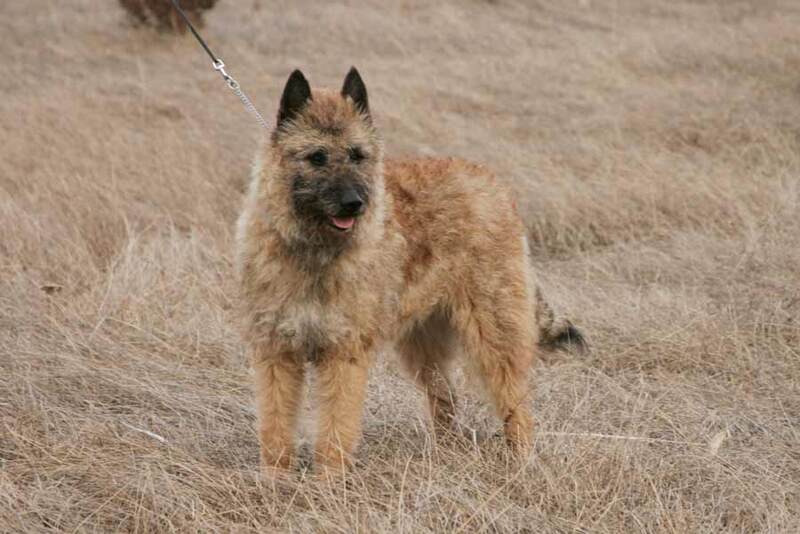 The Belgian Laekenois coat is wiry and can be fawn to mahogany, usually with a touch of black. Grooming the weather-resistant wire coat is not difficult. It should be brushed twice a week. The Belgian Laekenois is a very active, high-energy dog breed. Vigorous daily exercise is very important; without exercise or a job to do, this breed will get into trouble. Long walks are great, but she will also need a jog alongside a bicycle, an agility training session, or a fast game of fetch. Early socialization is necessary, as the dog breed is reserved with strangers. Early training that continues into adulthood will not only teach household rules and social manners, but will give the dog mental stimulation. These alert, intelligent dogs were bred to work and will not be happy unless they have a job to do. They also excel at canine activities and sports, including agility, obedience competition, herding trials, and flyball. The Belgian Laekenois are watchful and protective. They are affectionate with their people but tend to bond more closely with one family member. They can be good with older children but will tend to try to herd them. They can be good with smaller pets if raised with them but, again, will try to herd cats. Health concerns include hip and elbow dysplasia, eye and thyroid problems, and epilepsy. Share your Belgian Laekenois story. Note: Upload only Belgian Laekenois picture or your picture with Belgian Laekenois below - spammer's ip may be blocked.